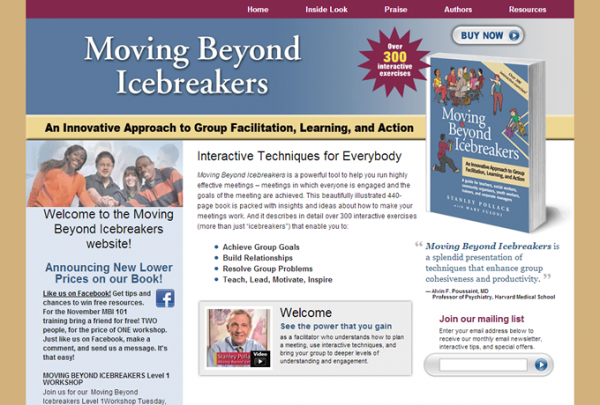 The Center for Teen Empowerment approached designer Maureen Precopio, who had done print work for them before, looking to build a website to market the book Moving Beyond Icebreakers, written by CTE founder Stanley Pollack and his co-author Mary Fusoni. Maureen asked Tech-Tamer to build the site that she designed for them. The site’s content isn’t complex — it’s all about one book — but its purpose extends beyond simply selling the book: it is also a resource for anyone wanting to learn about the book’s techniques, and offers both video and text-based lesson samples. The site is built on Tech-Tamer’s custom framework for sites that are relatively small and feature mainly static content. However, it employs an online content management service to allow the site’s owners easy access to any content they do wish to update.